This video tutorial for angel earrings is a fun way to have this lovely jewelry with you. 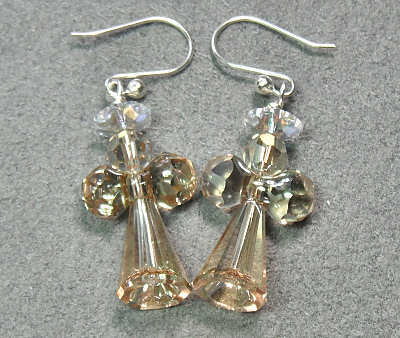 Although traditionally worn around Christmas (like the Christmas tree earrings), they can really be worn year ’round. You don’t need much in the way of supplies for these earrings, but they do include beads that you might not have on hand. All the beads I am using in the video are made by Swarovski. So if you like these earrings, I suggest getting enough supplies for several pairs, so you have extra on hand for those last-minute gifts! Two pair of pliers are useful. You’ll definitely need the round nose pliers, and another set is really useful when making the wrapped loops, to get them nice and tight. The colors I used are crystal and crystal AB for pattern #1. For pattern #2 I used golden shadow and crystal AB. You are certainly welcome to use these color combos, but I also encourage you to explore other colors as well. And remember — you can use larger beads to make some pendants! 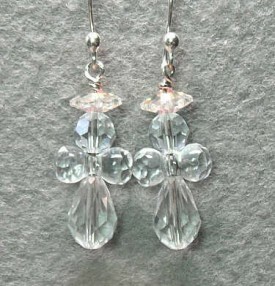 I hope you have enjoyed this video tutorial for angel earrings. For instant gratification jewelry that can be worn all year long, they are hard to beat.